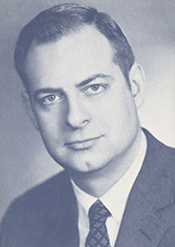 BIESTER, Edward George, Jr., a Representative from Pennsylvania; born in Trevose, Bucks County, Pa., January 5, 1931; attended Doylestown public schools; graduated from the George School, Newtown, Pa., 1948; B.A., Wesleyan University, 1952; D.L., Temple University School of Law , 1955; admitted to Pennsylvania bar in 1956; assistant district attorney, Bucks County, 1958-1964; elected as a Republican to the Ninetieth and to the four succeeding Congresses (January 3, 1967-January 3, 1977); was not a candidate for reelection to the Ninety-fifth Congress in 1976; attorney general, Commonwealth of Pennsylvania, 1979-1980; judge, court of common pleas of Bucks County, seventh judicial district, 1980 to 2006; member, Office of Military Commissions, Department of Defense, 2003 to present; is a resident of Furlong, Pa.
Ralph Nader Congress Project. Citizens Look at Congress: Edward G. Biester, Jr., Republican Representative from Pennsylvania. Washington, D. C.: Grossman Publishers, 1972.